Malayala Manorama is a daily morning newspaper in Malayalam and is a superb advertising source because of its high reach. Being the largest circulated Malayalam newspaper, it is also the fifth largest newspaper all over India as surveyed by ABC in the year 2015. 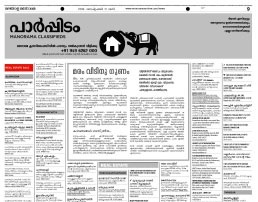 The design of the newspaper is considered to be the best amongst Malayalam newspapers and it has a readership of over 16 million. The newspaper also offers a weekly edition by the name of The Week. Booking advertisement in Malayala Manorama newspaper can be quite beneficial if you want to target the Southern audiences. Malayala Manorama ad rates are also cheap and give maximum benefit. You can get cheap Malayala Manorama newspaper classified advertisement rate with bookmyad to book any kind of display ad, classified ad and many others. You can also book your business ads, property ads, matrimonial ads, tender ads and many more at discounted rates. With us you can make your advertisement reach out to people all over the nation on a big scale including major cities like Delhi, Mumbai, Bangalore, Kolkata, Chennai, Chandigarh, Nagpur and many more other cities like these. Contact us for best packages and discounts.